On An Overgrown Path: Music to listener or listener to music? Music to listener or listener to music? Taking the listener to the music via a seat in an acoustically satisfying concert hall or a high fidelity recording is central to the classical music experience. 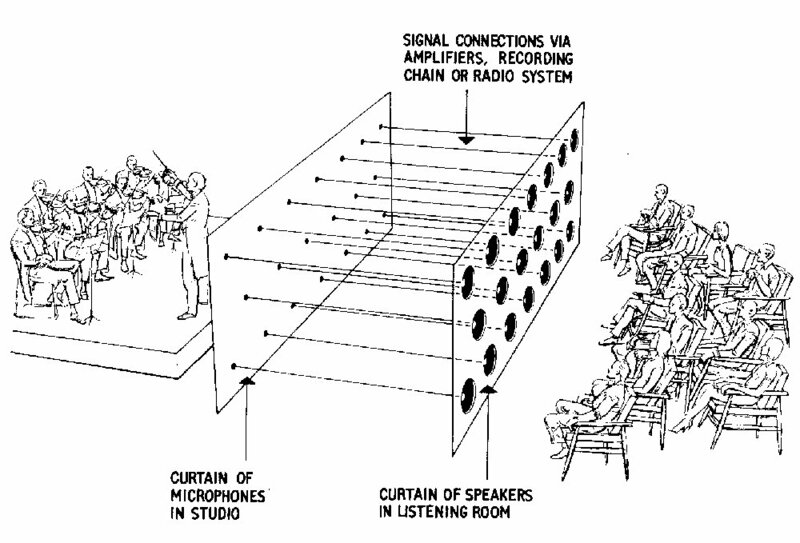 In the early 1930s Harvey Fletcher at Bell Telephone Laboratories anticipated stereophony and demonstrated the principle of listener to music using the multi-channel ‘curtain of sound’ seen above - left click to enlarge. 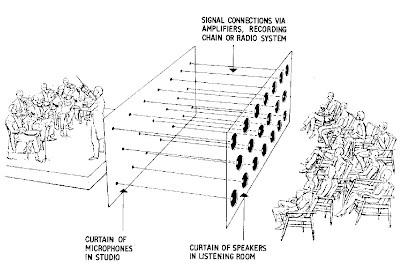 The 'curtain of sound' worked on the theory that if multiple microphones are placed in front of an orchestra, and loudspeakers are placed in identical positions in a different room with each microphone feeding a corresponding speaker, the sound image captured by the curtain of microphones will be faithfully recreated by the curtain of loudspeakers. As the theoretical optimum of an infinite number of channels between microphone and loudspeaker was impractical, the minimum number of channels needed to create a credible stereo image was determined by experiment. Interestingly in view of the use of centre channels in audio visual formats eighty years later, it was concluded that a minimum of three channels was required. In 1933 a concert in the Philadelphia Academy of Music performed by the Philadelphia Orchestra under Leopold Stokowski was relayed from the concert hall to an adjacent room by a Bell Telephone three channel sound system. This successful experiment was extended in a later concert when the orchestra’s deputy conductor took the baton in Philadelphia with the three audio channels travelling over balanced phone lines to Washington where Stokowski presided over the first-ever mixing session before an invited audience in Constitution Hall. Despite Harvey Fletetcher being dubbed ‘the father of stereo’, his trailblazing experiments at Bell Telephone in fact postdated by several years Alan Blumlein’s development of stereo recording for EMI in England. Blumlein’s pioneering work established that a credible stereo image could be created using just two ‘crossed’ microphones known as a ‘Blumlein pair’. 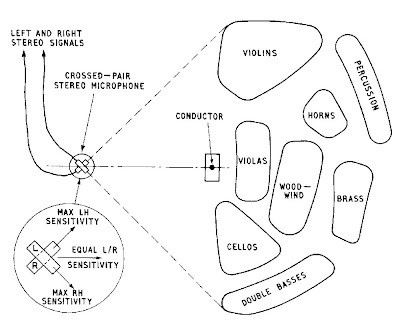 This simple approach to microphone placement - seen in the graphic below – was refined over the years by the selective addition of microphones, and the result was an ‘Indian summer’ of outstanding stereo recordings from EMI, Decca and others in the 1960s and 70s. But, as stereo recordings became more ambitious, some production teams added even more microphones – multi-miking - when recording large and complex scores. 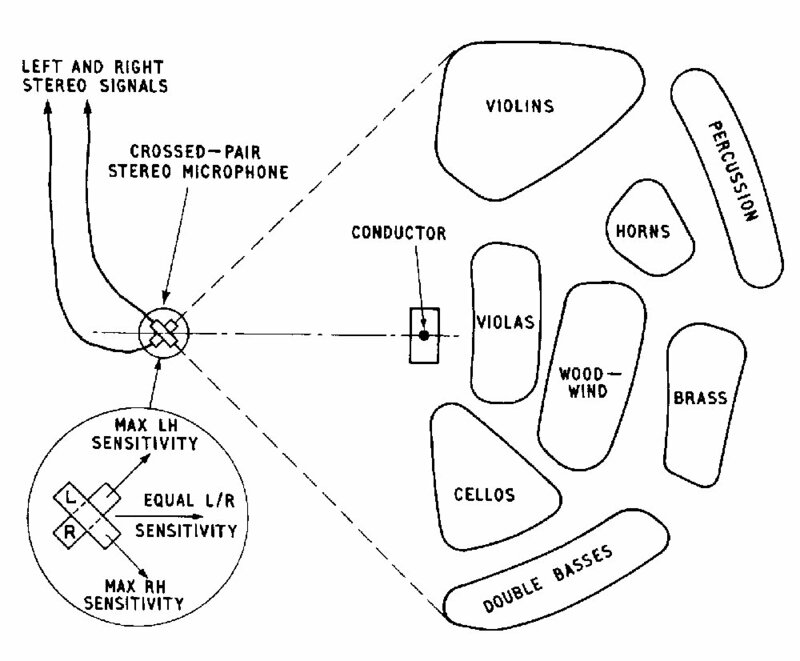 An example is seen in the graphic below which shows the microphone layout for CBS’ recording of Mahler’s Eighth Symphony in Walthamstow Town Hall in 1966 with Leonard Bernstein conducting the London Symphony Orchestra. The final mix was created using a 1960s state-of-the-art seventeen channel console, and two trivia points are worth noting about the recording. One is that in a pre-echo of today’s multi-channel formats the sessions were captured on a three channel tape machine; the third centre channel information was used for the rear speakers in the SQ quadraphonic mix, and was split equally (double mono) across the two front channels in the stereo mix. 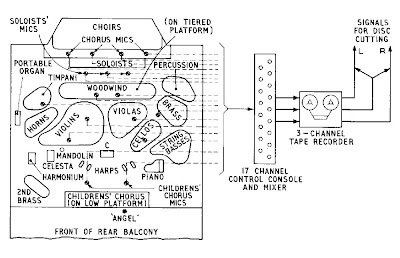 The second point is that the portable organ shown on the orchestra plan - which does not have a dedicated microphone - was only used at the Walthamstow sessions, the organ part heard on the final release was recorded later in Zurich Cathedral and added to the final mix. Alan Blumlein and Harvey Fletcher’s pioneering work on opposite sides of the Atlantic resulted in two ‘schools’ of microphone placement developing in the stereo era. The American school, with its roots in Bell Telephone’s ‘curtain of sound’, favoured the multiple microphone approach. By contrast the British/European school, with its roots in the ‘Blumlein pair’, favoured simpler microphone placement. 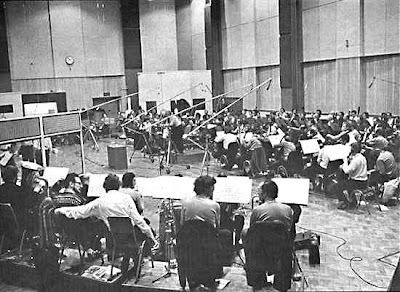 In the photo below taken at an EMI Kingsway Hall session for Elgar's Dream of Gerontius conducted by Sir Adrian Boult the comparatively simple microphone array can be seen. The simpler British/European school of microphone placement produced the most realistic and purist sound, as can be heard in Decca and EMI’s iconic Kingsway Hall recordings. But these recordings were subtle rather than showy and could sometimes sound thin and unimpressive to untutored ears when replayed on cheaper stereo systems. There was also the disadvantage that the recording engineers needed specialist knowledge to determine microphone placement, and expensive studio session time was required to balance the sound as there was little scope for correcting errors at later remixing sessions. Predictably the American school produced the opposite results: the sound was less refined but more ‘in your face’, microphone set-up was faster and less skilled, and technical and music balance problems could be ironed out by post-session remixing. In recent years the classical recording landscape has changed completely. 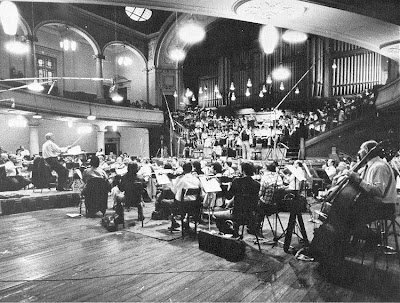 Financial pressures and the consequent advent of ‘live’ concert recordings by orchestra owned record labels mean the more flexible and lower cost American model dominates, to the extent that the geographic labels are now redundant as multi-miking has virtually become standard on both sides of the Atlantic. This has, inevitably, resulted in compromises in sound quality – and let’s not forget that sound is the only currency that classical music trades in. Back in 2011 I asked the question Do concert recordings make sound sense? and reader Dave Thomas recently added a perceptive comment to that post which highlights the tension between the purist and multi-miking schools of classical recording. In his comment Dave says “the problem with so many LSO Live discs is… over-miking. By spotlighting every last section of the orchestra one renders the overall picture flat and two-dimensional. There's no depth perception. The LSO-Live Mahler cycle suffers greatly for this”. 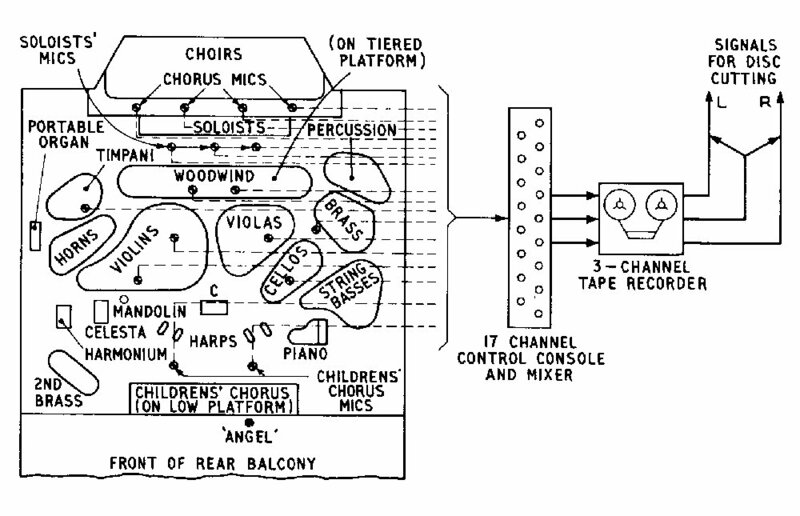 The three accompanying graphics showing different ways of bringing music to listener are reproduced from John Crabbe’s book Hi-Fi in the Home; this was published in 1968 and went through four editions in five years, but has long been out of print. John Crabbe, who edited the influential Hi-Fi News magazine from 1964 to 1982, was a renaissance man whose expertise covered both the art and the science of music - read an excellent interview with him via this link. The technical content of Hi-Fi in the Home is now little more than a curiosity as it predates the advent of digital technology by a decade. But John Crabbe’s succinct explanation of the unchangeable but often ignored acoustic principles that underpin music reproduction remains unsurpassed - the book’s continuing relevance is shown by the huge readership generated by my recent post Why louder classical music is better classical music which was inspired by part of the book . (On a personal aside I freelanced for Hi-Fi News in the 1970s and was offered the post of deputy editor by John Crabbe in 1976, but I turned his generous offer down as my preference was to stay on the commercial side of the music industry). The chapter in Hi-Fi in the Home from which the accompanying graphics are reproduced is titled Music to Listener or Listener to Music? In it John Crabbe argues the point that the role of the recording and reproduction process is to take the listener to the music by providing an aural window (as in the Philadelphia experiment) into the performance, and not to take the music to the listener by using technology to ‘enhance’ it – one notorious example of music to listener was CBS’ quadraphonic mix for Bernstein’s 1973 Rite of Spring which positioned the listener in the middle of the orchestra - see Abbey Road session photo below. John Crabbe was writing almost fifty years ago, yet his advocacy of listener to the music is just as relevant today and, indeed, that relevance now extends beyond recorded music to concert performances. Today’s strategy of choice is to take classical music to the listener by repurposing and repackaging it using alternative venues, etiquette-free concerts, sound bite symphonies, tweeting in concerts, salacious blogs and other big new ideas, all of which will, doubtless, prove as ephemeral as Bernstein’s immersive Rite. In a recent post titled Why classical music needs to be sticky I wrote that “Of course change is needed, but that change must build on what currently works, not demolish it”. What has been overlooked by the big new ideas brigade is that the one thing that works every time is the music itself. And it is that simple fact that tells us that classical music’s future depends on taking the listener to the music, and not the music to the listener. Thanks for this excellent post. One thing though -- your contrasting the minimally-miked early stereo of the UK labrels and the multi-miked stereo of the US labels overlooks the best of the early US stereo recordings - the RCA "Living Stereo" and Mercury "Living Presence" recordings, recorded with only two or three microphones: left/right or left/center/right. I listen today with enormous pleasure to these recordings, which captured the sense of being in the hall with the orchestra vastly better than most later over-miked recordings. No excuses for the omission, but it is always difficult to decide where to draw the line in wide-ranging posts such as this. Cut from an early draft was mention of some of the fine 'minimalist' recordings still being made outside mainstream classical. MA Recordings and Ad Vitam are two labels still producing outstanding sounding recordings that have been featured here. Heh - I was just thinking about the 3-mic setup recordings of Mercury, as they are pretty up front about it on the Hanson symphonies boxed set. There's generally 3 clear mics in Avery Fischer Hall for the Young Persons Concerts of Bernstein - I can't say if they brought it additional mics for the actual formal recordings which did take place in that hall according to the liner notes for most of the Sony releases. As for sounding like you're in the orchestra? Well there's something to be said for that. I personally hate 5.1 recordings where the bulk of the sound is still concentrated in the front center speaker. Seems a waste. What I want is to stop hearing the rest of the outside world, so leaving the back speakers with just an ambience echo just doesn't work for me. MTT's DVD (and blue-ray) of Appalachian Spring for the Keeping Score series at least gives both options - one being a 5.1 mix meant to sound like you're in the front rows, and another meant to sound like you're on the conductor's podium (which was almost centered within the 13 players). Nice compromise, but only good when you have DVDs with multi-audio options, and also works better for the chamber nature of the score, and probably wouldn't if doing the orchestral suite. The most extreme example of minimalism would be the recordings presented by the PlayClassics record label. This label is the front end of an acoustic research project aimed at developing, for the first time in history, a completely transparent audio recording system. Their methodology (Truthful Recording Technology) allows for recordings that do not need any king of treatment. With no equalization, no mixing, no mastering, no dynamic range compression, they are the purest stereo recordings ever made. They have recorded a wide range of instruments this way (different grand pianos, violin, viola, cello, oboe, clarinet, bassoon, french horn, spanish guitar, flamenco guitar, soprano, tenor, ...even a drum set) and the result is always the same: a clean natural sound with the presence of the real life performance.